As interest in the environment has grown, so too has our selection of native plants and wildflowers. 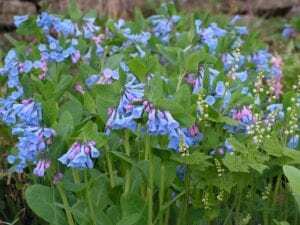 We carry many shade-loving spring wildflowers, including Trillium and Virginia Bluebells, plus an extensive selection of sunny meadow plants such as Milkweed and Joe-Pye Weed. Gardeners have really caught on to the benefits of native plants. Native plants grow naturally and without assistance in our environment, making them durable, undemanding plants that perform in the garden without much fuss. Most are drought tolerant and require little in the way of additional fertilizer. Nearly all native plants support beneficial insects, and many have specific connections with particular insects, such as the relationship between Monarch butterflies and milkweed. Butterflies of all kinds use the flowers of native plants as a nectar source. In addition to attracting butterflies, native plants appeal to other beneficial insects, such as pollinator bees and wasps. In the garden, beneficial insects help keep more destructive insects under control. And let’s not forget that the seeds of native plants, including many native grasses, are high-energy foods for songbirds.